The house Polifemo is equipped for max six and consists of: 2 double bedrooms (Queen size or twins bed) with their own bath with shower (2), a small mezzanine with two single beds over the living room ideal for children 5/13 , a living room including a kitchen corner and an exclusive furnished patio-gazebo with canes canopy and creepers(9x9 mt.) and a garden (9x9 mt.). All rooms are equipped with air conditioning units (hot and cold air). For rental conditions, included services and facilities see the Rental agreement or ask to the owner. The four houses are named Luna-Polifemo- Leone and Trinacria and derive from the refurbishment of an old farmstead located in the stunning countryside of Taormina and more precisely in a princely family estate producing oranges, lemons, olive oil and wine. The cottage LUNA is equipped for max 6 pax (4 adults and 2 children) and consists of 2 double bedrooms with their own bath with shower (2 bathrooms with shower in all), a confortable kitchen-dining-living room with a small mezzanine with 2 beds for children 5/13, an exclusive gazebo with cane covering and creepers ideal to stay al fresco or have meals. Max 4 adults + 2 children (5-13 years). The cottage POLIFEMO is equipped for max 6 pax (4 adults and 2 children) and consists of 2 double bedrooms with their own bath with shower (2 bathrooms with shower in all), a living room with a kitchinette and a small mezzanine with 2 beds for children 5/13, an exclusive gazebo with cane covering and creepers ideal to stay al fresco or have meals. Max 4 adults + 2 children (5-13 years). The cottage LEONE AND TRINACRIA are equipped for max 4 pax (2 adults and 2 children) and consist each one of 1 double bedroom with his own bath with shower, a kitchen-dining-living room with a small mezzanine with 2 beds for children 5/13, an exclusive gazebo with cane covering and creepers ideal to stay al fresco or have meals. Max 2 adults + 2 children (5-13 years). The 4 houses share a mature lush extended garden with a big stunning pool area with solarium in the lemongrove. The pool is available from May on. Changeover day preference : Saturday (other dates must be agreed with the owner). Services and facilities included in the price: weekly linen and towels, shaded parking area , communal swimming pool,wifi, communal washing machine. A dream place for a dream holiday. Ideal for country lovers, amazing garden and pool area, lemons, oranges, olive trees and flowers. Close to Taormina and to the beach. 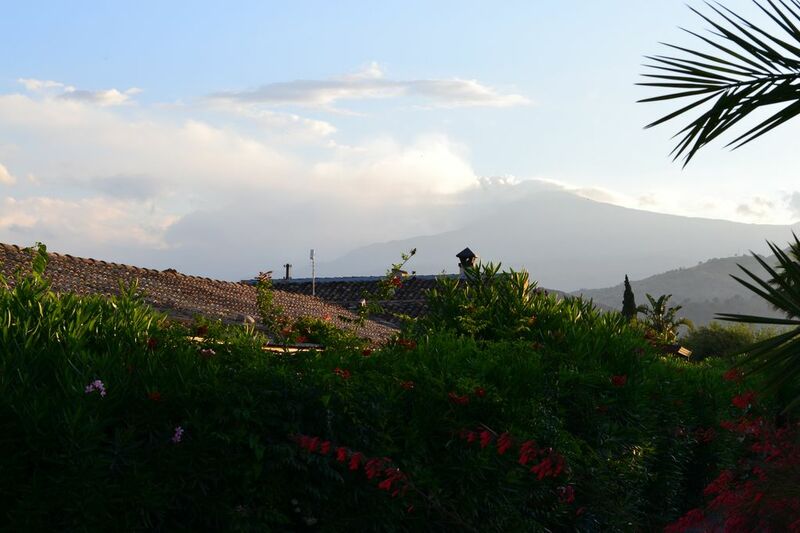 Spectacular view of Etna and in the mean time away from it all. There is a person encharged for check-in, check-out and guests assistance during the stay. There is a mantainor for any tecnical problem occurring and the owner lives in the estate for most part of the year. stunning countryside and garden. Close to the beach and Taormina. great view of the Etna volcano. We spent two weeks in Polifemo this summer. It is part of a small complex of well appointed holiday homes situated in beautiful grounds, all with shared access to a large swimming pool. The property was very much as we expected from the listing description, if not better. It was very clean and well-maintained. We received a lot of helpful advice on arrival from Monica with useful recommendations on where to go, local supermarkets and good local restaurants. Both Gabriele, the owner, and Monica were extremely helpful to us when our rental car got a flat tyre, directing us to a local tyre bay and helping us to change the wheel. The customer service throughout was outstanding. I would certainly recommend this property to a friend, relative or anyone else who would listen to me. In terms of local attractions, this property is well placed for anyone wishing to explore Messina, Taormina and North East Sicily as well as Mount Etna, Catania and Siracusa. Our favourite things to do locally were the cable car up Mount Etna, the cool waters of the Alcantara gorge, the beautiful Greek/Roman theatre in Taormina and the fabulous and historic city of Siracusa. The restaurants nearby were wonderful and we didn't have a disappointing meal the whole time we were there. Two particular favourites were Paradise near Gaggi and Al Giardino just outside the gate of the Taormina Giardino Pubblico. We liked the food and service so much, we went twice. Thankyou Monica and Gabriele for an absolutely fabulous holiday. So many thanks for the wonderful review with so many useful infos. Ideal for country lovers and in the mean time close to the beach and Taormina center town (10-15 minutes driving). Car necessary. The holiday homes are located amid the peace of the Sicilian countryside, 2 kms from the sea, 7 from the centre of Taormina, 10 from the Gorges of Alcantara, 35 from Etna (cableway), 100 from Syracuse, 150 from Noto, Modica and Ragusa Ibla and 90 from Piazza Armerina. The property is the ideal base for visiting the oriental Sicily. Other Activities: Etna excursions, Gorges of Alcantara discovery, Syracuse, Noto (barok valley), Piazza Armerina (roman villa), valle d'Agrò, Savoca the village where the Godfather was filmed.